Study with Steve from home! Open Studio, a leading provider of premium online jazz education, announces the launch of the first-ever jazz saxophone course from acclaimed saxophonist, Steve Wilson. In Steve Wilson: Fundamentals of Jazz Saxophone, he teaches aspiring jazz saxophonists how to reach the next level and beyond as jazz artists. Steve teaches how to feel over the barline in odd meters. Gain insights into composition, soloing, phrasing and more. He demonstrates all this and more with stunning performances of original compositions and jazz standards, playing solo and with a quartet. Click here to view Free Video Excerpts of Steve Wilson: Fundamentals of Jazz Saxophone. Deeply committed to continuing the oral tradition of jazz, Steve Wilson dedicates a good portion of his year to educating future audiences and musicians. "Steve Wilson's clinic sessions rank among the very top in content, interaction, inspiration, and sheer attention level" (Antonio J. Garcia, Virginia Commonwealth University). He tailors his sessions for his audience and "as an effective communicator, knowledgeable educator and gifted musician, Steve [leaves] a positive legacy with students" (Dave Barber, CITYFOLK). An in-demand and passionate educator Wilson is currently the Director of Jazz Studies at City College of New York, and formerly an adjunct faculty member at the Juilliard School. Like many artists who have experience performing and working with a variety of styles, you have matured into one of the best teachers I know. You took very quickly what was in hand, assessed the students and got right to the heart of what they needed to work on, and directed them in a very positive and encouraging way. I work with some fine musicians who don't do that like you do, Steve. You are a brilliant educator, and I will always lend you support in any way I can. Any institution would be fortunate to have an artist of your caliber work with their students. Your special gifts are in your knowledge of jazz history, great skills on the technical side of the music, and your vast experience on the stages you've played with so many musicians over the last 20+ years. You have a very special way of conveying all of that information to the students you teach. Click to read a PDF of the original letter. "Steve was absolutely fabulous last week in his master class. The students loved him!! He was everything I knew he would be and even more." "As a guest artist/clinician, Steve Wilson is the total package. He has the unique ability to present concepts that are sufficiently challenging for advanced students, yet accessible for beginning students. Our students loved his demeanor and teaching approach. His performance with our jazz ensemble was exceptional. He is one of the best saxophonists on the scene today." generosity of time resonate so deeply with our students. await our next opportunity to share time with Steve. Such a pleasure! Bach Trombone Clinician, Conn-Selmer, Inc.
"Just a quick note of thanks to you and to Steve for his appearance at our jazz festival at UNC. Everyone admires and respects Steve so very much. He is the consummate musician-artist-teacher." 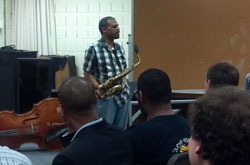 "Steve Wilson came to Hamilton College where I am the director of jazz studies. His quartet was the best four clinicians that we have had at the school in the ten years that I have directed the program. They were hip, funny, talented, patient, knowledgeable and the students enjoyed working with them ever so much. Their ability to demonstrate specific styles in class was a huge help to the jazz history classes and to the students who wanted to develop their skills to the next level. The selection that Steve performed with the ensemble was a great way for Steve to pick the band up on his shoulders and make them play at his level. The concert that the quartet performed covered many styles and tempos and displayed a marvelous sense of interaction amongst the musicians. Some of the softer pieces were so delicate that the auditorium was simply silent waiting for the next note. The level of musicianship was superb. The meals and the laughter that we shared was like fine wine!!! What a joy to be in the presence of such talented people!!"